Playing golf in Android has never been this fun with Golf Star APK 4.3.2. As a rare golf game for your Android device, Golf Star is indeed the ultimate golf game you will play on your Android. Tap the screen of your Android device and swing the stick to throw yourself among the top golf players. To add more challenge, the game will demand the skills and accuracy of you, the golfer, as you are thrown into very realistic golfing scenarios. 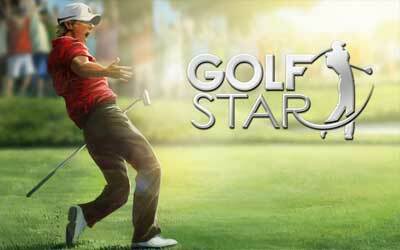 Golf Star will give you the most realistic golfing experience you can get from a simple tap of your Android device. Swing the ball to the hole by using real techniques and skills attained from real life. As you put yourself into the shoes of a professional-in-training, you will choose up to 10 different techniques to put the balls into the hole. There are many fun modes you can play, such as the Career mode, Friend Match mode, 1-on-1 Match mode, and Event Tournaments. The intense of each mode brings you closer even more to the world of golf, as you play against your friend in Friend Match or one of many famous golfers in 1-on-1 Match. The stunning visual design of Golf Star is something unusual and unlike the other games. And the challenge is getting even tougher with realistic challenges on the field. Those include the impact angle, wind direction, terrain height, the humidity and temperature, and also the other 70 factors that will test you relentlessly. You can also join the Tournaments every week to get the prize and the Grand Slam title. To further rack up your fame, play your game and sign a contract with sponsors that will help you toward the top. Finally, you can join a guild in order to shape your skills and become the number one guild ever. Golf Star for Android is really the future of golfing experience.